In case you haven't heard, bone broths(s) is seriously trending right now. I'm happy that it is finally getting the spotlight it deserves, as I have been sipping on broth in my coffee mug/tea cup for years now. Something, in fact, that I grew up with in a European household. I have my mom to thank for it. I'm sorry I haven't shared my recipes yet, but that's all going to change now. If you aren't already making bone broth or your own broth regularly, I'd encourage you to start today. Many people moan about cooking their own homemade stock/broth, it's not that hard and fool-proof. Ditch the boxed crap, its super high in sodium and other unnatural flavorings and preservatives. Trust me, once you can make a homemade brother, you will never go back to fake stuff. I promise! Every single Chef or restaurant incorporates a bone broth in their cooking. Besides giving rich flavor to your dishes (soups, stews, risotto), it has a tremendous impact on health. It is filled nutrients, it helps boosts your immune system and aid digestion. I am so obsessed with bone broth I sip on it almost daily in the Winter months to keep colds and flu away. It also gives me glowing skin and loads of energy. You can always make bone broth and keep it in the freezer, when a cold comes on, you'll be glad you did. 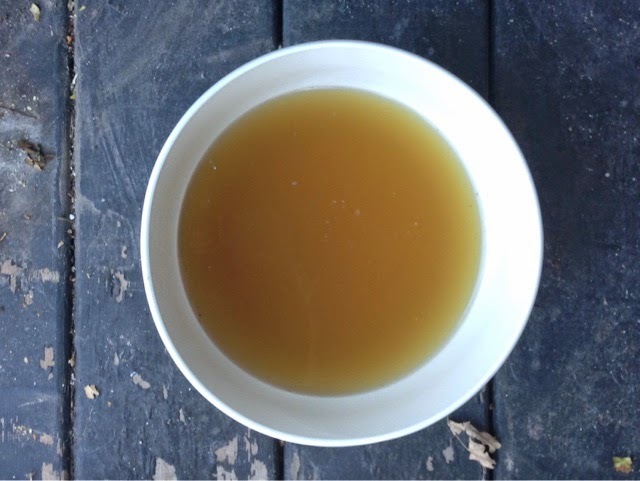 With Thanksgiving around the corner, it's a perfect opportunity for you to take the turkey bones and carcass to make a bone broth. Use the highest quality of bones you can find, I recommend grass-fed. I only use meat from The Butcher and Larder. Add vinegar, like Bragg's apple cider vinegar, to the water to draw the minerals out of the bones into the broth. Roast and brown the bones in the oven before adding them to the stock. This is a tip I received a couple years ago from Chef David Dworshak from Takito Kitchen when I was in a gumbo-off. In a stock pot add all ingredients. Make sure to wash the carrots, celery and herbs. I like to keep skin on onions as it adds a beautiful golden color. Pour in water, I use filtered water, enough to cover the ingredients. Over medium heat, bring to boil. When it's boiling, a film of foam will begin to form, start skimming the foam out. Once the film is removed, cover the pot, lower to a simmer. Let simmer 3 hours-18 hours. The longer it simmers, the more flavor your broth will have. I like to store my broth in glass jars or freeze in ice cube trays.